The Manipur Pradesh Congress Committee (MPCC) has threatened to take the path of agitation, if the Bharatiya Janata Party (BJP) led governments both at the Centre and the State, fail to immediately clarify the incursion of Myanmar at the cost of Manipur’s land. MPCC spokesperson Khumukcham Joykishan on Sunday questioned the Central government that on what ground the BJP government has given away Manipur’s land to Myanmar. Interacting with media in Imphal, the MPCC spokesperson said that Union Home Minister of State, Kiren Rijiju has confessed that the land has been given to Myanmar by saying that ‘there is no border dispute between India and Myanmar’. Rijiju was in Imphal on a two-day visit to review security situation in the State. The Congress spokesperson alleged that Rijiju’s statement is a ‘confession’ that the border pillar was shifted by Myanmar with the consent of BJP led government at the Centre. 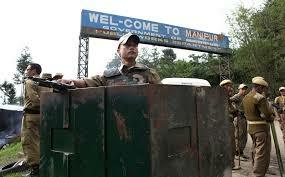 Manipur government on June 27 constituted a high level committee with minister Shyam as its chairman and special secretary (home), Manipur Kh Raghumani Singh as the convenor after report of incursion by Myanmar along the subsidiary border pillar situated in Tengnoupal district. The committee led by its chairman was scheduled to visit the disputed site to ascertain the factual ground position of the recently erected subsidiary border pillars on June 28. However, it was cancelled with no reason raising quite a few eyebrows among the political circle of the State.